The Logic Controls TD3000 Series has been discontinued. No direct replacement is available. 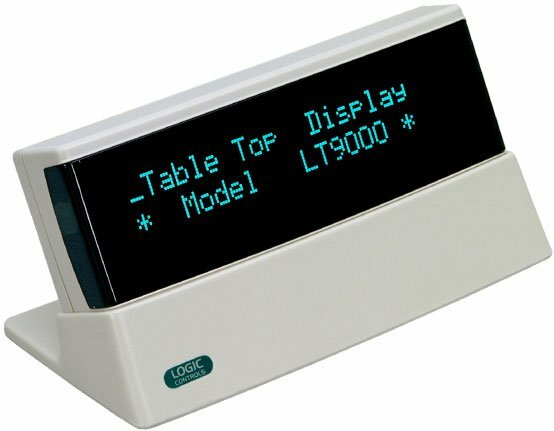 The TD3000 Series Table Display provides an alternative to the traditional pole display. The TD3000 Series Table display provides an alternative to the traditional pole display. Mounting on the counter is ideal when standard pole displays cannot be used. USB Interface, 2 line x 20 column, Blue-Green vacuum fluorescent display, 5 mm Character Height. Color: White. RJ-11 & Serial Interface, DB-9 Connector, 2 line x 20 column, Blue-Green vacuum fluorescent display, 5 mm Character Height, with Logic Controls Command Set, and Power Adapter. Color: Black.